Did you draw pictures when you were a child? Do you have children in your life who love to spend time drawing or always want to take photos with your camera? These activities reflect a particular way of seeing and experiencing the world. I had these interests as a child and they carried through into my teenage and adult life. Today, I take photos, make greeting cards, sell prints, make jewelry in order to fulfill my desire to make art. 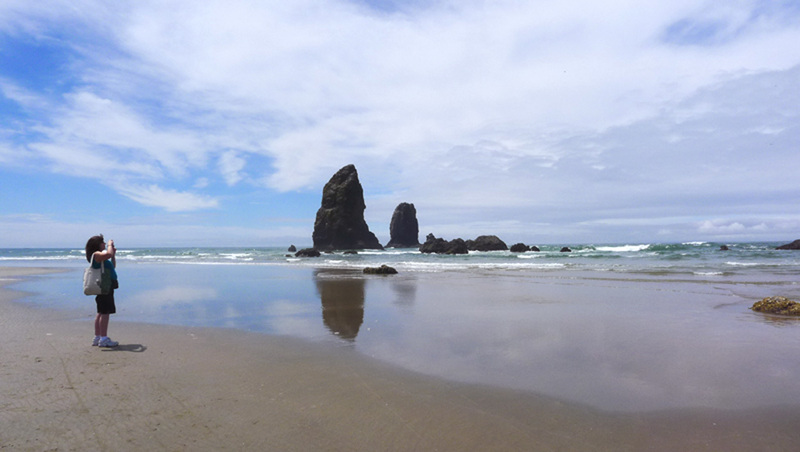 My friend Michelle and I decided to take a day and drive to Cannon Beach on the Oregon coast. It was a lovely day and we enjoyed every bit of it: a picnic lunch on the beach, a long walk with pauses to take photos and marvel at the beauty of the place, time to rest and soak up the sun, and then a fine crab cake dinner. It is so important to take the time to break away from ordinary life and do something totally different. Michelle took the photo of me while I was taking a photo of Haystack Rock! She has a wide-angle lens and takes wonderful photos. Check out her website at http://lichenandlarkspur.blogspot.com. There are times when I know I need to take a break from writing and the work I do at my computer and do something that is creative in a visual/spatial way. When this happens I shut down my computer and settle into my craft room. Then I make jewelry or purses and I’m content for hours. Later, I return to my computer energized and happy.